The Ferdinand, based on the Tiger (P) chassis, could be a formidable weapon if use appropriately. 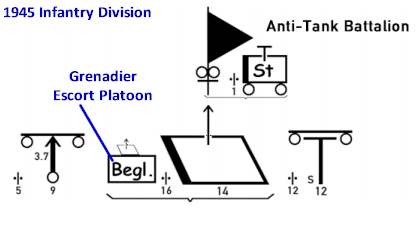 The Panzerjäger Tiger (P) organization was similar to that of the independent Tiger battalions and consisted of a battalion with three panzerjäger companies. The Tiger (P) was developed as a concept for a heavy tank. It was a very complex design that combined an internal combustion engine with electric generators and motors for the actual drive mechanism. The Tiger (P), officially designated the the VK4501(P), also had longitudinal torsion bar suspension that would prove problematic due to the weight of the vehicle. The design, though innovative proved to be impractical and unreliable for a variety of reasons and so in late 1942 the project was canceled; however, not before 100 chassis had been delivered. It was decided that these chassis would be used for self-propelled anti-tank guns that were armed with newly designed high-velocity long barreled 88 mm cannons. The guns were ball mounted into a large superstructure that sat on top of the chassis. These guns were designated the 8.8 cm Pak L/71. The vehicle would be known as the Panzerjäger Tiger (P). The total weight of this colossal vehicle was 65 metric tons. The 653rd and 654th Heavy Tank Destroyer Battalions (schwere Panzerjäger Abteilung 653 u. 654) were formed from the 197th and 190th Assault Gun Battalions and equipped with 45 Ferdinand’s (Sd.Kfz. 184) each. They were designated as the 1st and 2nd battalions of the newly formed 656th Heavy Tank Destroyer Regiment (schwere Panzerjäger Regiment 656). Also added to this regiment, as the third battalion, was the 216th Assault Tank Battalion (Sturmpanzer Abteilung 216). 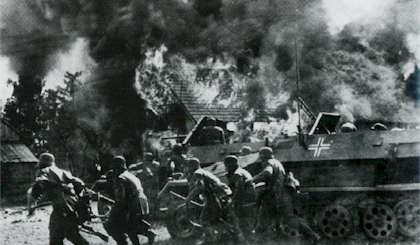 The 216th also had 45 vehicles but these were Sturmpanzer IV (Sd.Kfz. 166) with a short-barreled 15 cm gun. 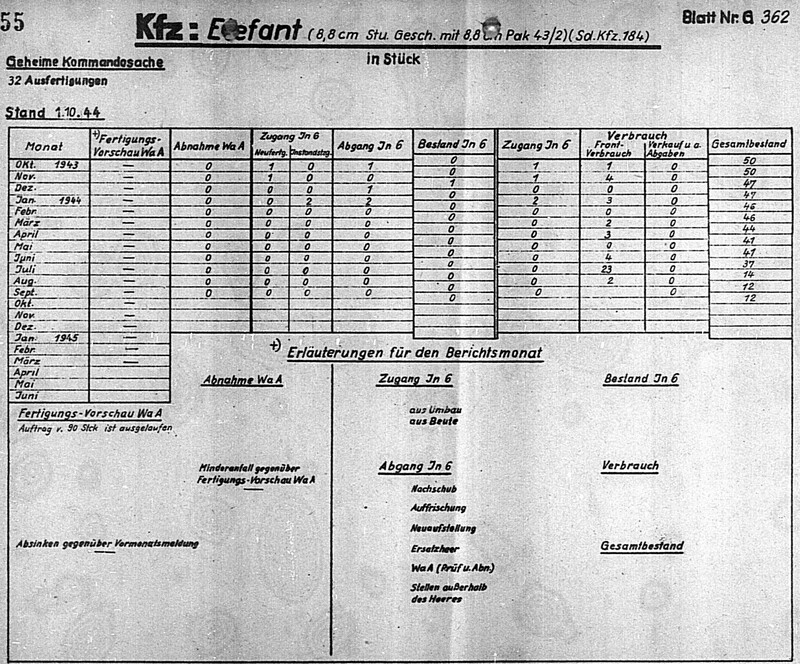 The first employment of the Ferdinand’s was in July of 1943 for operation Zitadelle at Kursk. They were assigned to the 9th Army of Army Group Center. Contrary to their intended role, the Ferdinand’s were tasked with supporting the infantry in breaching fortified enemy positions. Though they had some limited success, the Ferdinand fell victim to mine fields in great numbers. Compounding the problem was the lack of proper equipment to recover the disabled Ferdinand’s. 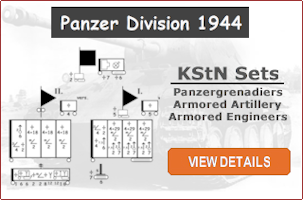 It could take as many as five Sd.kfz. 9’s to pull a Ferdinand over the soft terrain. Many of the Ferdinand’s were never recovered. By the end of 1943 there were less than 50 remaining Ferdinand’s. These were sent back to Nibelungenwerk for complete rebuilds. 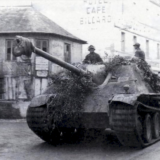 The Ferdinand’s were organized into independent heavy tank destroyer battalions. New K.St.N. were created specifically for the Ferdinand and released on March 31st, 1943. The battalion consisted of the K.St.N. below. The personnel counts are also indicated below and if we take into account there were three Ferdinand companies in the battalion that would bring the total to about 1367 men. During the early/mid war period the headquarters and the headquarters company were two separate units. Later in the war these were typically combined into a single headquarters and headquarters company unit. The HQ’s staff unit was very small and consisted of the Battalion Staff, messengers and signals personnel. It was organized under K.St.N. 1106c v31.3.1943. The Headquarters Company had reconnaissance and engineer platoons. There was nothing really interesting about the reconnaissance vehicles as they were authorized Kfz. 1’s. The signals vehicles were also soft skinned as opposed to armored. It did have an anti-aircraft platoon with three Sd.Kfz. 7/1, 2 cm Flak Vierling half-tracks. It also had a workshop unit with a Bergegrupp. The vehicles in workshop included an Kfz.100 with a 3t crane and an Sd.kfz.9/1 with a 6t crane. 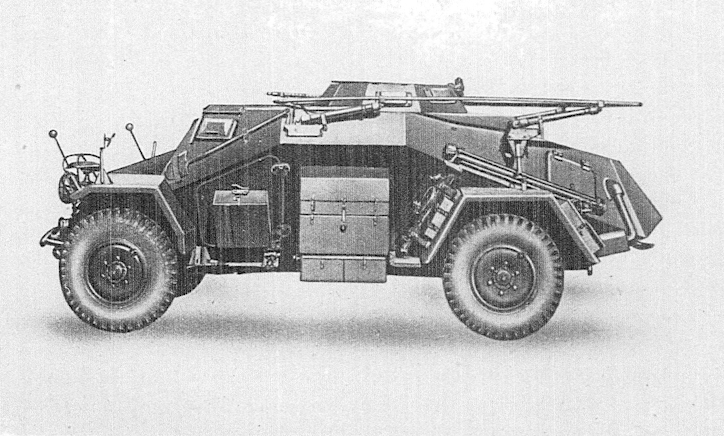 For towing duties, the Bergegruppe was authorized two Zugkraftwagen 35t (Sd.kfz.20.) A footnote indicates that if these were not available then three schw.Zgkw. 18t (Sd.Kfz. 9) could be substituted. This was part of the problem at Kursk: not only were these heavy towing vehicles not available but the substitution ratio was inadequate. The company also included various other support troops and more interestingly three Pazerjäger Tiger (P). 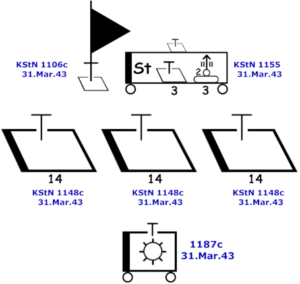 The company was organized under K.St.N. 1155 v31.3.1943. The Tank Destroyer Company had two Panzerjäger Tiger (P) in the commander’s group. 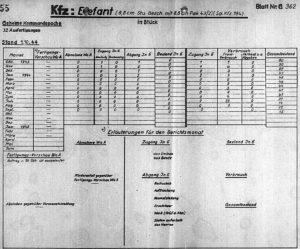 It then had four Panzerjäger Tiger (P) in each of three platoons for a total of 14 tank destroyers in the company. Having three companies in the battalion these 42 tank destroyers along with the three in the HQ’s Company brought the total for the battalion to 45. They were organized under K.St.N. 1148c v31.3.1943. The workshop company provided additional mechanics and technicians along with a few more Sd.Kfz.9/1 cranes. The recovery platoon was authorizes 15 Sd.Kfz.9’s. The workshop company was organized under K.St.N. 1187c v31.3.1943. The Ferdinand, even with its short comings, was a formidable weapon. Had it been deployed more advantageously at Kursk and had its recovery requirements been better thought out, it could have had a much different results.